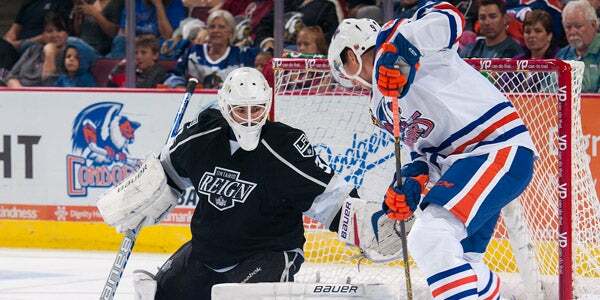 Kris Newbury scored two goals and an assist and Peter Budaj made 21 saves to propel the Ontario Reign (1-0-0-0) to their first AHL victory in team history with a 5-0 win over the Bakersfield Condors (1-1-0-0) at Rabobank Arena. Captain Vincent LoVerde captured the first AHL goal in team history 8:53 into the first period beating Condors goaltender Laurent Brossoit (35 saves) under the blocker with a drive from the right-wing point. Newbury and Adrian Kempe added assists. Scott Sabourin gave the Reign a two-goal advantage at 17:54 smashing in a rebound off of defenseman Jamie McBain’s shot from between the faceoff circles. The Regin continued to light the lamp in the second period as Newbury buried two goals and Paul Bissonnette added an unassisted marker for a 5-0 advantage. Newbury grabbed his first marker of the season at 10:20 off a rebound from forward Michael Merschand netted a power-play tally moments later, redirecting a shot from forward Sean Backmanat 13:48. LoVerde picked up the second assist. A minute later, Bissonnette capitalized off a Condors turnover in the right-wing corner to complete the game scoring. The Reign finished the contest 1-for-3 on the power play while the Condors went 0-for-7.